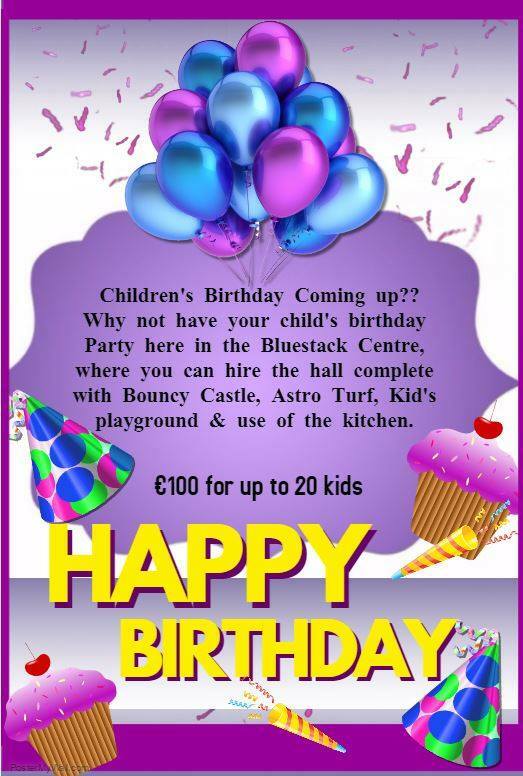 The Bluestack Centre in Drimarone is the perfect venue for your child’s Birthday Party. Our competitive price includes the hire of the hall, Bouncy Castle, exclusive use of the Astro turf and access to our state of the art Children’s playground. Bring your own food to prepare in the fully equipped kitchen plus there is plenty of free parking right outside the Bluestack Centre. We have 2 time slots available Saturday’s and Sunday’s either 1pm to 3pm or 4pm to 6pm. If you choose to have your party on a weekday (Monday to Friday) there is a 10% discount. Please note: you will have 30 mins after your party to tidy up and remove any rubbish. Book today and make your party the one everyone is talking about!